Describing the 4CITIES experience is never an easy task. Yes, it’s an academic program, but the uniqueness and intensity of spending two years in four different countries with a cohort of fellow students from across the geographic, academic, and cultural spectrum is hardly done justice by referring to it solely as such. 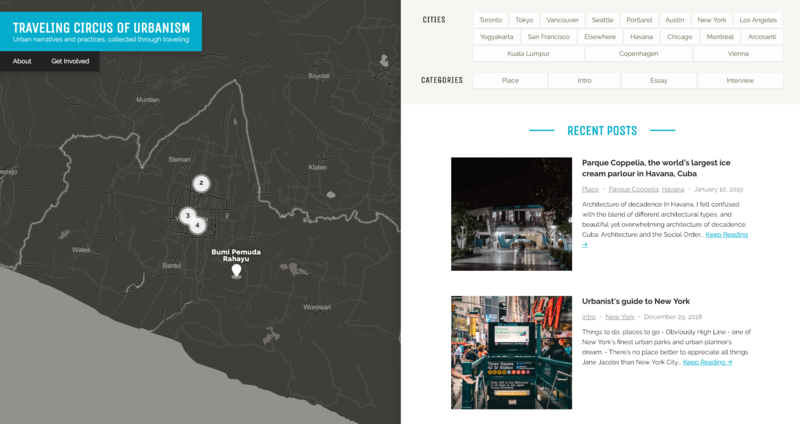 Some years ago, the description “a traveling circus of urbanism” was jokingly suggested, and if the new online platform for urban narratives founded by 4CITIES alum Mariko Sugita is any indication, it seems to have stuck. So, what is the Traveling Circus of Urbanism? The Traveling Circus of Urbanism is a platform for other urban narratives that are collected from the world through traveling. This is an exploration of various urban practices with a global perspective, in a way to challenge the focus on localism and ignorance of urbanists for what is happening in the world. Travel is a way to unravel the essence of places, seeing them from different perspectives and revealing how they are globally connected. A circus moves from a city to another, telling stories that are collected from its journey. Urbanism is about how people live in cities and interact with our urban environments. It covers a wide range of topics such as urban design, inclusive urbanism, community development, urban art and culture, politics and urban sustainability and more. You can discover where the circus has been and what stories it has picked up along the way here. Previous Previous post: What Would a City That is Safe for Women Look Like?